This book consists of essays dealing with the astronomical knowledge and beliefs of cultures outside the United States and Europe. In addition to articles surveying Islamic, Chinese, Native American, Aboriginal Australian, Polynesian, Egyptian, and Tibetan astronomy, among others, the book includes essays on Astronomy and Religion, Astronomy and Myth, and Astronomy and Astrology. 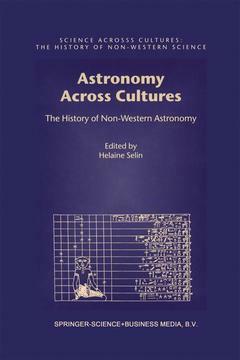 The essays address the connections between science and culture and relate the astronomical practices to the cultures which produced them. Each essay is well illustrated and contains an extensive bibliography. Acknowledgements. About the Authors. Introduction. 1. Sky Tales and Why We Tell Them. 2. Astronomy and Prehistory. 3. Astronomy and the Dreaming: The Astronomy of the Aboriginal Australians. 4. Useful and Conceptual Astronomy in Ancient Hawaii. 5. Ancient Astronomical Monuments in Polynesia. 6. A Polynesia Astronomical Perspective: the Maori of New Zealand. 7. The Inca: Rulers of the Andes, Children of the Sun. 8. Mesoamerican Astronomy and the Ritual Calendar. 9. Native American Astronomy: Traditions, Symbols, Ceremonies, Calendars, and Ruins. 10. Birth and Development of Indian Astronomy. 11. Remarks on the Origin of Indo-Tibetan Astronomy. 12. Indo-Malay Astronomy. 13. A Cultural History of Astronomy in Japan. 14. History of Astronomy in Korea. 15. Crossing the Boundaries Between Heaven and Man: Astronomy in Ancient China. 16. Astronomical Practices in Africa South of the Sahara. 17. Astronomy in Ancient Egypt. 18. Babylonian Astrology: Its Origin and Legacy in Europe. 19. Hebrew Astronomy: Deep Soundings from a Rich Tradition. 20. Mathematical Astronomy in Islamic Civilization. 21. Islamic Folk Astronomy. Index.